Today, I thought I’d share some details on how C lost 60 pounds through a combination of HCG (human chorionic gonadotropin) and flexible dieting. C is 58 years old, and she has been overweight most of her life. C told me she had done the original HCG Diet once before and lost 28 pounds. Sadly, she regained it all because she didn’t have a plan for after the diet ended. She wanted to give the HCG Diet another try because it was the only diet that she could lose weight on. The challenge was how to keep the weight off when the diet ended. I am very familiar with the HCG Diet. I have done it myself and experimented with different medications and protocols. I even wrote a book about it. I believe the HCG Hormone (the real kind, that you get from a doctor’s prescription) may impact leptin, which reduces hunger levels. C and I worked together through all phases of the diet. The Preparation Phase, The Diet Phase, The Transition Phase, and the Maintenance Phase. We slowly transitioned her back to “real life” when the diet ended with a plan so she wouldn’t gain all the weight back. C now has the tools and knowledge to manage her weight for the rest of her life. For the first time, I no longer fear regaining all the weight – Adele has given me the tools to know just what to do to keep the weight off. I’ve had so many non-scale victories along with the weight loss. I feel more confident than ever and my weight is the lowest it’s been for decades! C lost 30.7 pounds in her first 60-day round of HCG and then followed my advice and took a 2-month break from dieting to restore her hormones and metabolism. Although C felt good and wanted to keep dieting, I explained that the break would help her in the long run. Between rounds, we reverse dieted her back up to 2200 calories. Interestingly, C lost another 4 pounds during her diet break, eating about 2200 calories a day. That’s right: she ate 2200 calories a day after her first round was over, and still managed to lose weight. As you can see, her metabolism wasn’t “damaged” by the rapid weight loss. C went on to complete one more 60-day round of HCG, and lost 28 more pounds. In total, C has lost 60 pounds and is maintaining her weight loss through the skills of flexible dieting and greater nutritional awareness; skills we practiced throughout her weight loss journey. C lost about half a pound a day, which is about average for a woman on the HCG Diet. However, she did it by consuming almost twice the amount of food that is permitted on the original Simeons Protocol. She was also able to eat a huge variety of foods that are not allowed on the original protocol. As a result, she was able to eat in a manner that better suited her tastes. By keeping a food diary, she learned a great deal about what foods help or hinder her fat loss. She ate almost 1000 calories a day and a substantial amount of protein to minimize potential muscle loss. She had great energy throughout the diet and didn’t find it too difficult. She rarely felt hungry, and her mood was great. In fact, C felt so good that she was actually a bit reluctant to come off the hormone and diet! *1000 calories is below recommended daily intake. Keep in mind that calories are always low on rapid-weight loss diets. However, the HCG hormone allows you to consume a meager amount of calories and not feel like you’re starving. The hormone may also be protective of muscle loss. 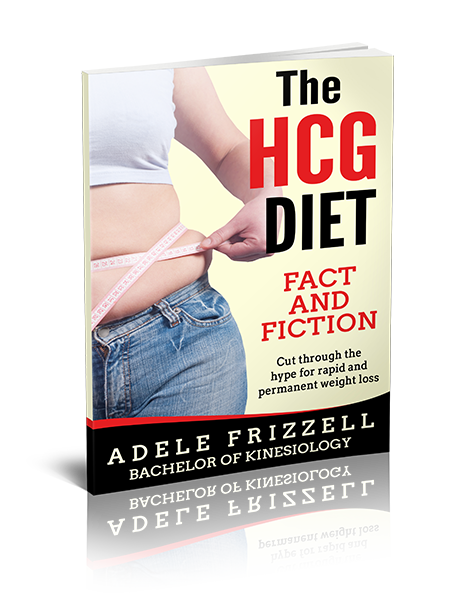 My book takes a deep dive into how the HCG works, why it works, and what you can expect to happen to your body. While a slow and steady weight loss of 1% of body weight a week is usually best, there are situations where rapid weight loss is needed or desired. There is also some research to suggest that a faster initial weight loss can inspire people to stick with a diet, which produces better long-term results. Seeing the scale go down every day can be highly motivating! The old adage, “the faster it comes off, the faster it goes back on” doesn’t have to be true IF the client is taught how to transition to real life and how to maintain their weight when the diet ends. While not everyone is a good candidate for rapid weight loss, C was healthy, highly motivated, and 100% committed to the process. She was also prepared to change her nutrition habits, such as eating breakfast every day, and eating more protein. This dedication allowed her to be successful and her new habits will allow her to maintain her weight in the future. Are you ready to lose weight and keep it off for good? Whether it’s fast or slow, I can help. Book a FREE 1:1 weight loss breakthrough coaching session at https://calendly.com/adelefrizzell. Happy New Year Adele: I live in Costa Rica(close to Panama), its a spanish spoken country, but my english is not too bad. I am very interested in your program, I tried with HCG with success in loosing wait in my first round but started to gain wait. I did many rounds but fail. It´s a little difficult to get the real HCG, Istarted on monday 7th with an homeopathic version, Im trying to get the inyections with a doctor. I´m 56 years old, controllled high blood pressure, want to exercise during hcg.